The best of Disney's recent glut of live-action remakes of their animated classics have been the ones that haven't hewed so closely to the original films as to become almost shot-for-shot remakes. I'm thinking, of course, of Kenneth Branagh's Cinderella and David Lowery's Pete's Dragon, both fantastic films in their own right that captured the spirit of the original while charting their own course. Tim Burton may be responsible for one of the absolute worst Disney remakes, 2010's garish Alice in Wonderland, but he has more than redeemed himself with his new remake of Dumbo (1941), a delightful flight of fantasy that expands beyond the original film and becomes something wholly its own. The film is squarely in Burton's comfort zone, there's a circus, unusual characters, and a protagonist who doesn't fit in with the world around him. Burton has always had an affinity for society's outcasts, from Vincent to Edward Scissorhands to Ed Wood to Frankenweenie, the loners and the unloved have always been the center of Burton's universe. So the story of a big-eared elephant who overcomes his differences by learning to fly seems a perfect vehicle for Burton, bringing in a certain sense of emotional grounding that has been missing from his more recent filmography. The story is, by now, familiar. But Burton doesn't simply retell Dumbo with real actors. This time, Dumbo's circle is bought out by a sinister corporation who wants to exploit Dumbo for cash while laying off the rest of the circus performers. There's something deeply ironic about Disney releasing this film the very week that they laid off the entire staff of Fox 2000 after buying out 20th Century Fox, but Burton almost seems to be mischievously tweaking the very company he's working for. That's not to say that Disney released a film whose content they were unaware of, because naturally they're in full control of their own intellectual properties, but there's something almost subversive about the anti-corporate message at the heart of Dumbo. Call it hypocrisy on Disney's part, call it tone-deafness, call it what you will, but I applaud what Burton is doing here, tweaking the machine and thumbing his nose at the capitalist system from the inside. 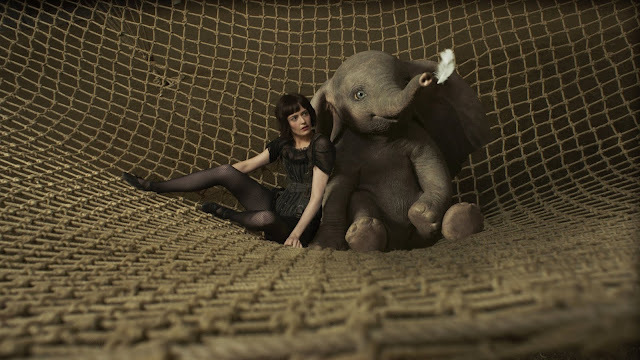 Dumbo is Burton's best film in recent memory, at least since Sweeney Todd (2007), finding a sense of wonder and beauty in the trappings of a turn-of-the-century circus. It's all thoroughly modern, with an anti-captivity message and a noticeable lack of the racist crows from the original (the Jim Crow character was cringe-y even by the standards of 1941), but Burton finds an old-fashioned spirit of kindness and generosity in a film that could have easily been another product in Disney's live action assembly line. Come for the timeless story, stay for Danny DeVito as a two-bit huckster with a heart of gold and Michael Keaton's wonderfully bizarre performance as the villainous CEO. There's a glimmer of some old-school Burton lunacy here, and in Dumbo it actually feels like something akin to an emotional return to form. 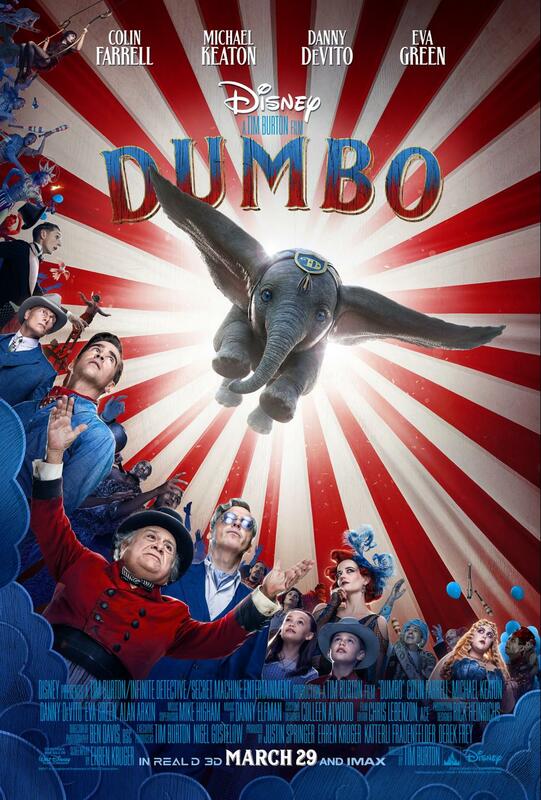 When Dumbo takes off on the wings of Danny Elfman's soaring score, you'll believe an elephant can fly.